The plight of honeybees and other pollinators is no secret these days. It’s in the news. It’s in the movies. And the subject is certainly no stranger to the pages of bionomicfuel.com largely because dwindling pollinators is pretty scary. Of course, that’s bad news, but it’s also old news. The new bad news, if you will, is that our urban environments are so polluted with paper and plastic litter that urban bees and wasps have actually had to start using our refuse as nest-building material. That’s right. A new study of bee behavior conducted by Scott Maclvor of the University of Guelph in Ontario discovered that urban pollinators have started to replace the plant resins that usually comprise their nests with polyurethane-based exterior building sealant.The insects use the found plastic materials like caulking for the brood cells that house their larvae. "Plastic waste pervades the global landscape," said MacIvor. "Although researchers have shown adverse impacts of the material on species and the ecosystem, few scientists have observed insects adapting to a plastic-rich environment. So, despite being stressed by colony collapse disorder as well as various mites and viruses, a handful of bee species have actually managed to adapt to their changing environment with more gusto and ingenuity that we have. 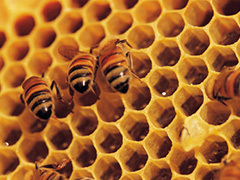 The bees utilize the plastic by chewing it up and spitting it out to form something new. The regurgitated plastic usually bears markings indicating that this new practice is conscious and purposeful. But why? Well, that’s the good news. It turns out that plastic upchuck can make a pretty good home for bee larvae. Posted on February 17th under Global Ecology.